With St. Patrick’s Day fast approaching, have a little fun by dressing up your house for the holiday. While you may not want to go full scale and decorate the whole house like for the bigger holidays, choosing a smaller room like the bathroom can be a fun idea. 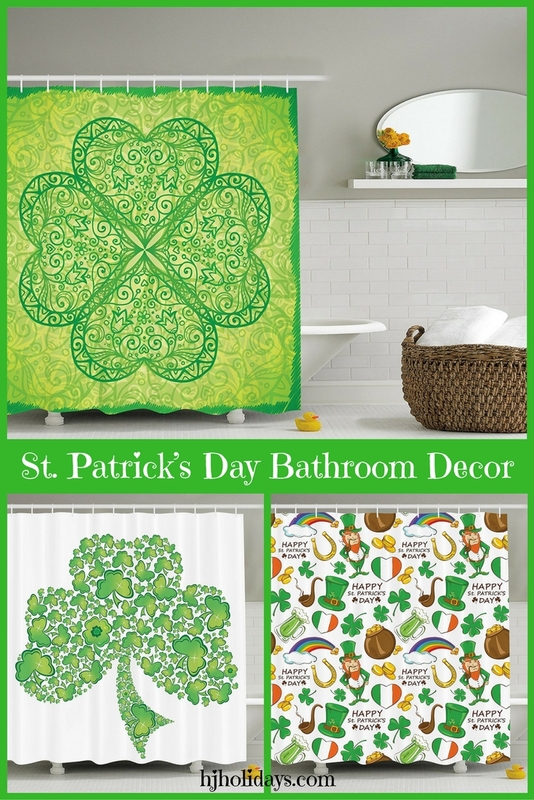 Here we look at some shamrock bathroom decor and other ideas you can use for St. Patrick’s Day bathroom decor to make your main bath or guest bath look great… and green! Whether you are Irish or not, it’s still fun to get into the spirit of things. This is a set of two hand towels which could be used in either the bathroom or kitchen. Each towel measures 25 inches by 15 inches. 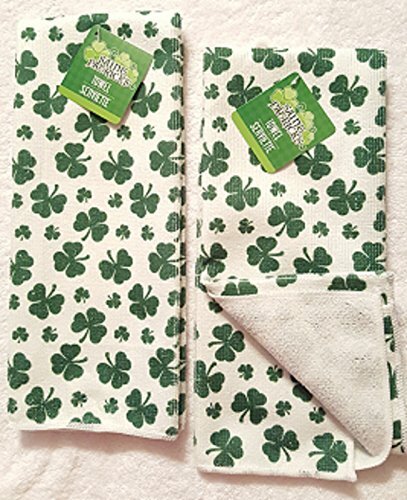 Towels are white with a mixture of both large and small green shamrocks. Adds a cute and festive St. Patrick’s Day touch to any room you use them in. 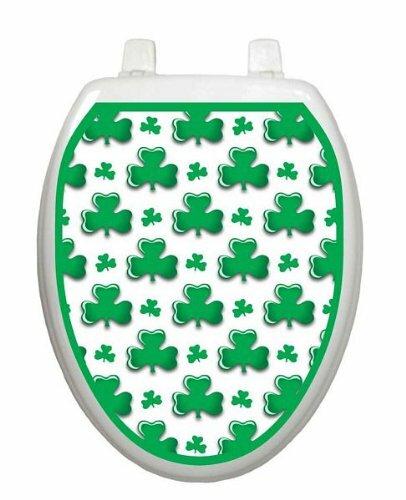 This cute night light brightens up the bathroom for St. Patrick’s Day. Measures 3.5 inches by 5 inches and uses a standard night light bulb. Fits any US socket. 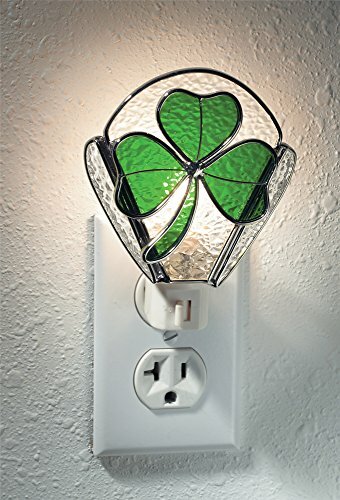 Made of genuine stained glass with a green Irish shamrock. This is a removable applique made from electrostatic vinyl film. Makes a great decoration for a toilet seat because it can be easily wiped clean, is removable, and reusable. Fits an elongated toilet seat. Simply place on top of the seat like you would use one of those static cling window decorations. A super easy way to dress up your bathroom for any holiday without having to commit to a permanent change. Available in two sizes, either 20 inches by 32 inches or 16 inches by 24 inches, these doormats are one half inch in thickness. They absorb water well, are stain resistant, and machine washable for easy care. Non-slip surface helps keep the rug in place and insulates and protects the floor surface at the same time. Made from soft and comfortable fleece material. Pattern is of a white background with green shamrocks and paler green shamrocks. Makes a great accent piece to enhance any shamrock bathroom decor. This shower curtain measures 60 inches by 72 inches and is made from soft and comfortable 100% polyester material. Great on both style and quality. Design features a pale green background with large green shamrocks scattered throughout. A great way to add to your St. Patrick’s Day bathroom decor while staying within a reasonable budget. Super cute and festive, as well as practical. 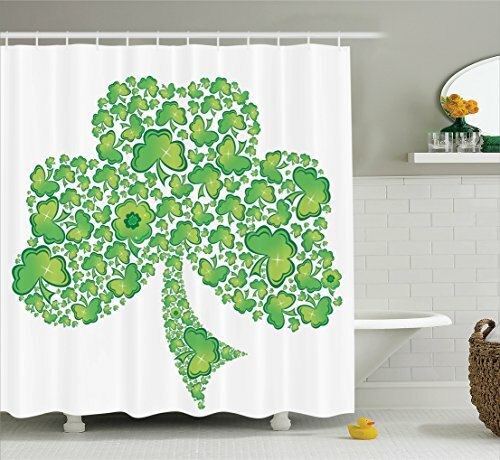 This shamrock shower curtain measures 69 inches by 70 inches. Made from 100% polyester, this shower curtain requires no liner and is also mold, mildew, and soap resistant. Contains no PEVA. Printed with bold graphics using no dye, is machine washable, and includes plastic hooks. 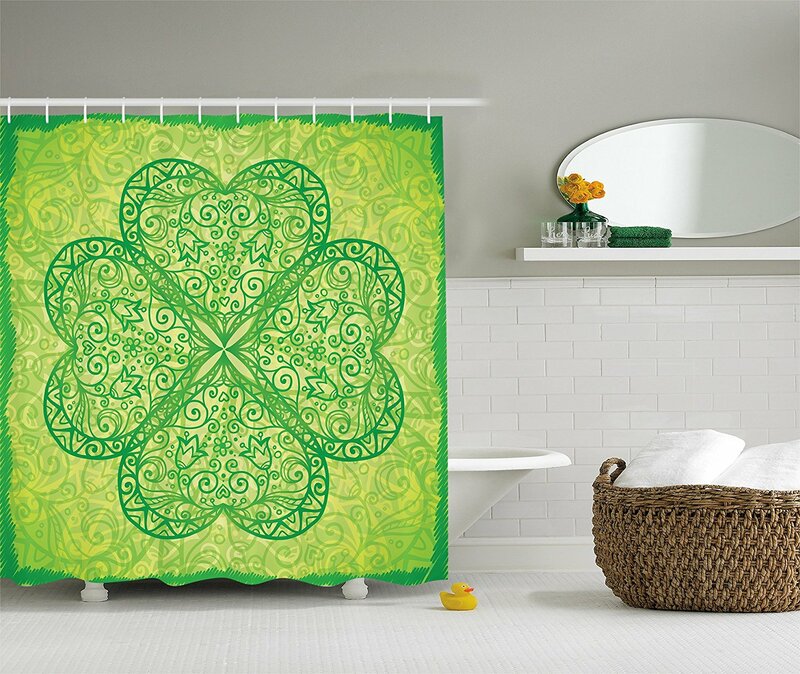 Patter features a huge green shamrock with intricate patterns within each of the four leaves, with a lighter green background with intricate patterns. Border is done in a darker green with a non uniform edging all the way around. This is a quality made shower curtain made from 100% softened polyester with stitch enforced eyelet for extra sturdiness. Measures 69 inches by 70 inches. Professionally printed image and curtain is designed to fit most tubs and shower stall configurations. Requires a shower liner and hooks. May be machine washed in cold water on delicate cycle and tumble dried on low setting. Pattern is of a background with various green hues, with floral sprigs and shamrocks in the design. Available in three sizes of 69 inches by 70 inches, 69 inches by 75 inches, and 69 inches by 84 inches. Curtain is made from polyester and is machine washable for easy care. Curtain is environmentally friendly, containing no PEVA and no vinyl. Shower curtain is waterproof, mold resistant, mildew resistant, and soap resistant. The bold graphics in the design are printed with state of the art digital printing technology. 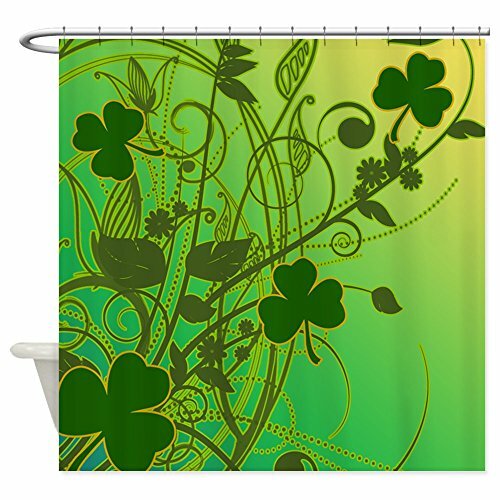 Design features a white background with huge green shamrock made up of a multitude of smaller green shamrocks. 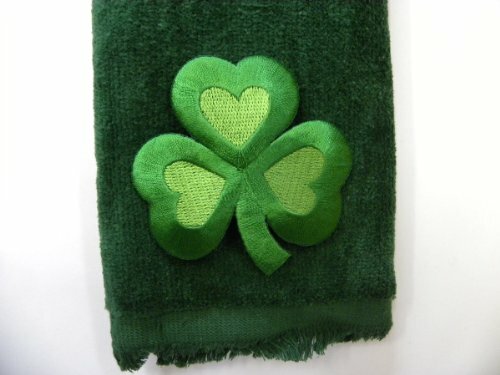 This fingertip towel is made from 100% cotton and makes a great addition to your St. Patrick’s Day bathroom decor. 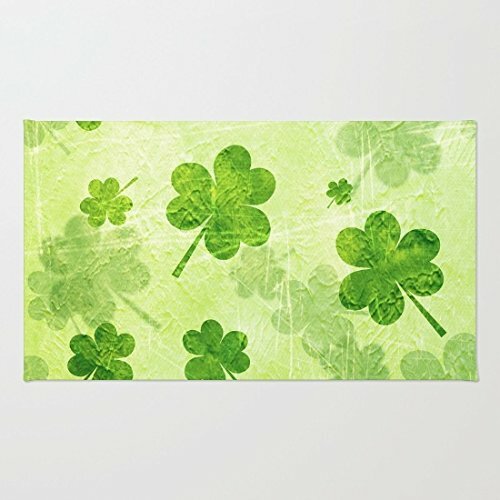 Towel has a dark green background and a large three leaf shamrock with heart shaped petals. Within the petals are lighter green heart shaped petal accents. Measures 11 inches by 18 inches. This shower curtain is available in three sizes, 69 inches by 70 inches, 69 inches by 75 inches, and 69 inches by 84 inches. Made from 100% polyester and contains no PEVA or vinyl, making it environmentally friendly. Machine washable with bold graphics printed with the latest in digital technology. 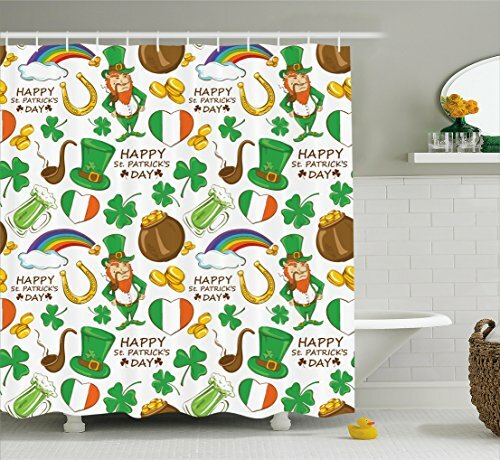 Curtain features a white background with various St. Patrick’s Day themed designs including a green top hat, pipe, horseshoe, green/white/red heart, shamrocks, rainbow, green beer mug, and pot of gold. 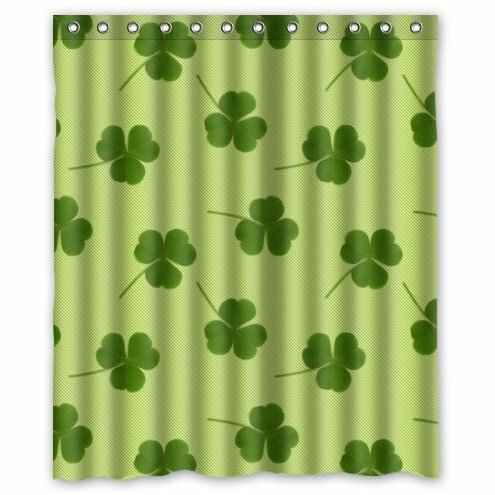 Curtain also includes the words “Happy St. Patrick’s Day” among the other designs. This is a soft and comfortable bath rug made from 100% polyester. 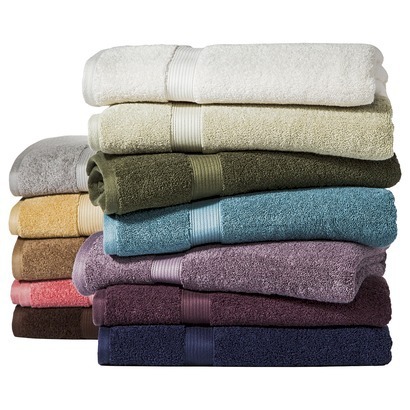 Microfiber material is excellent at absorbing water and dries quickly. Rug is rectangular with rounded corners and has a non skid backing. Can be used in a variety of rooms in the house for a great St. Patrick’s Day accent. Rug features a green background with a large “St. Patrick’s Day” in white lettering. 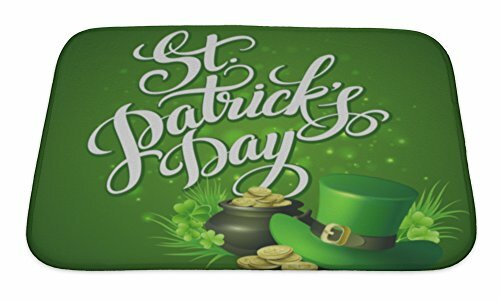 A large green top hat, pile of gold coins, pot of gold and some shamrocks also decorate this festive rug.